The Healthy Human 3-Piece Bamboo Brush Water Bottle Cleaning Set is the ideal addition to your Healthy Human collection. Designed with your health and safety in mind, these brushes are eco-friendly, 100 percent plastic-free and can be used with all sized Healthy Human products. 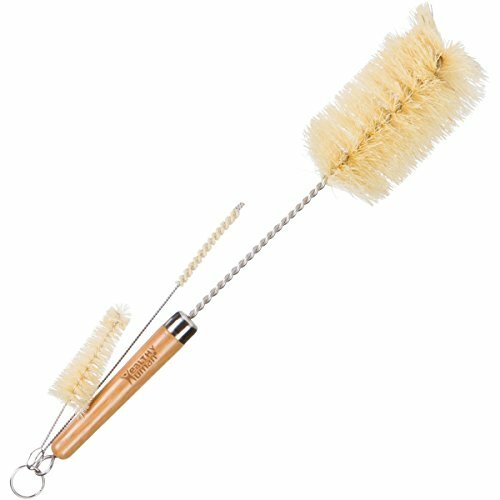 Made of the highest grade bamboo and natural Tampico fiber bristles sourced from Mexico, these brushes will extend the life of your Healthy Human bottles and accessories. This set includes everything you need to clean all of your Healthy Human products, including our bottles, stainless steel straws, caps and gaskets. Use these with warm, soapy water or a simple vinegar and baking soda solution. TAMPICO FIBER: Made of non toxic natural fiber sourced from Mexico, these soft, yet strong, long brushes make cleaning your water bottle a cinch. STAINLESS STEEL: The extra long brush handles are made of the highest grade 304 Food Grade Stainless Steel. Ideal sports thermos bottle brush. BAMBOO WOOD: Made of ecologically-friendly bamboo wood, these brushes are water-resistant and simple to maintain. PLASTIC-FREE: As with all Healthy Human products, these brushes are a plastic-free way to maintain and extend the life of your water bottles. FITS ALL SIZES: This 3-brush set is designed to clean Healthy Humans in all sizes. These are especially ideal for use with Healthy Human Steins. Also perfect for tumblers, beer, decanters, coffee, jars, cups, baby, kombucha and glass jars. If you have any questions about this product by Healthy Human, contact us by completing and submitting the form below. If you are looking for a specif part number, please include it with your message.